In the early 1930s, amidst the looming shadows of economic depression, Jo Mayer began looking for a buyer for his apothecary collection. 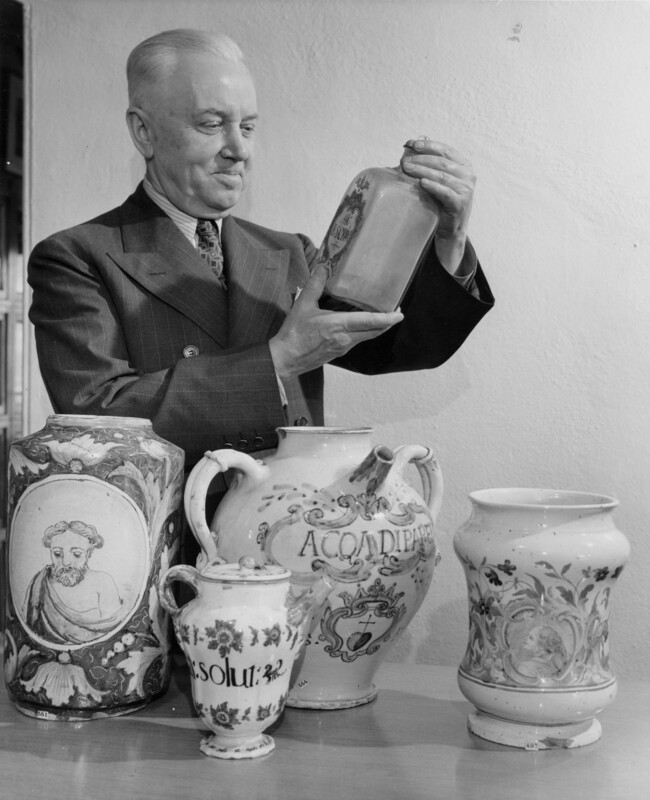 To promote the collection, Mayer’s friend and colleague Fritz Ferchl published five articles describing parts of the collection; mortars, books, portraits and pictures, drug containers, and a group of “rarities” in the Pharmazeutische Zeitung. His aim was to expose the collection to a wide audience in hopes of finding a buyer who would donate the collection to a proposed German pharmaceutical museum. When no one came forward Mayer looked for buyers elsewhere. Finally, in the fall of 1932, Theodore Weicker, chairman of the board of the E.R. Squibb Company came forward and purchased the collection through a Frenchman, M. René Wampach. An inventory and appraisal of the collection was conducted by E. M. Mossell of the New York firm of Frans Middlekoop upon its arrival to the United States in the fall of 1932. A close examination of the twenty-four page inventory reveals that numerous objects do not appear in the original inventory, although they do surface in The Squibb Ancient Pharmacy Catalogue of 1940. Additions to the collection included an oil painting of St. Jerome; a pair of 17th-century jars from Faenza, Italy; four 18- century covered jars from Urbino, Italy; and three late 17th-century jars. After the Chicago exposition, the collection returned to the company’s headquarters at Fifty-Eighth Street and Fifth Avenue in New York City. George Urdang, an historian of pharmacy and a refugee from Nazi Germany, was hired to write a catalogue of the collection. Because of its obscure location on the 28th floor of the Squibb Building, the collections saw few visitors beyond industry executives and pharmacy students. Recreating an “authentic” 18th-eighteenth century European Renaissance apothecary was an arduous task. The importance placed upon the installation of the European pharmacy is clearly outlined in the 1946 annual report of the Division of Medicine and Public Health. Two type-written pages detail the division’s mission. Smithsonian illustrator E.G. Cassidy was requisitioned to supervise the painting of the beamed ceilings. Additional craftsmen, including painters, plasterers, modelers, carpenters, and electricians from across the Institution, were assigned to work on this six-thousand square-foot exhibition. From start to finish, the project which included two separate spaces, a reception room and a laboratory, took just over a year to complete. The Squibb Ancient Pharmacy was one of the most significant acquisitions in years. The period rooms were a unique departure from the rows of exhibit cases filled with bottles of materia medica uniformly lined up like soldiers. Period rooms had been popular exhibition technique in art museums since the 1920s. The Smithsonian followed the lead of Colonial Williamsburg, Winterthur and the Metropolitan Museum of Art with the installation of the Colonial Room at the Natural History Museum. 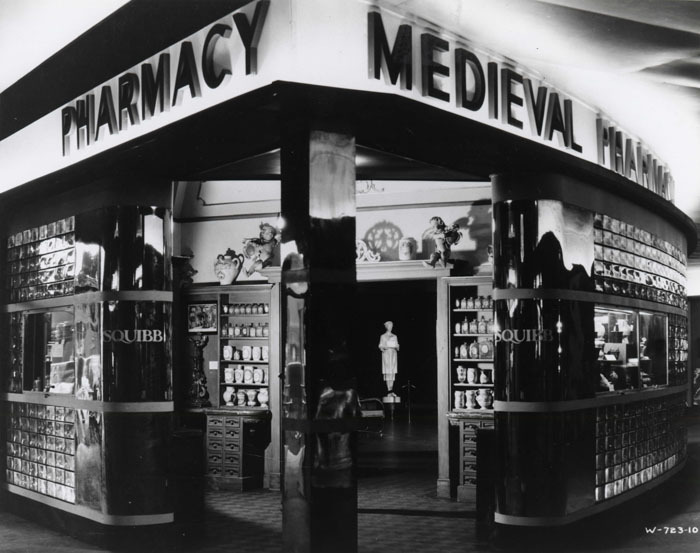 Nonetheless The Ancient Pharmacy was the first and for many years the only period room at the U.S. National Museum. 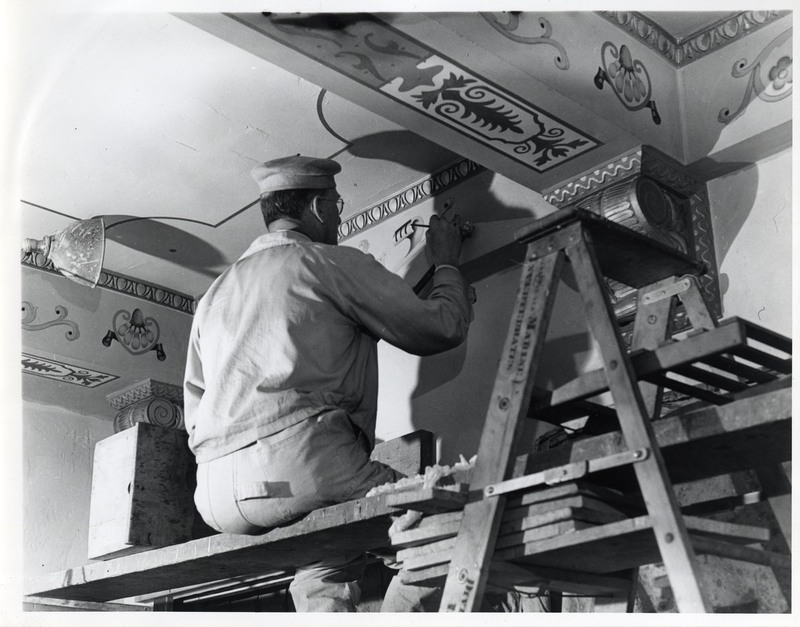 With the anticipated opening of the new National Museum of History and Technology (now the National Museum of American History) in 1964, plans were made to reinstall the Ancient Pharmacy. Under the direction of curator George Griffenhagen [1952-1959], the exhibit took on a new look. Following a trip to Europe during which he visited several museums and private pharmacy collections, including the new Deutsche Apotheken-Museum in Heidelberg, Griffenhagen decided several changes to the exhibit would be appropriate. Although the basic configuration of the exhibit had not changed since its days in Wiesbaden, Griffenhagen laid out a new plan that called for two entrances to the exhibit and a vaulted gothic-like ceiling. The exterior of the apothecary was designed to replicate the appearance of a street entrance and create the feeling when crossing the threshold that visitors were entering an actual building. 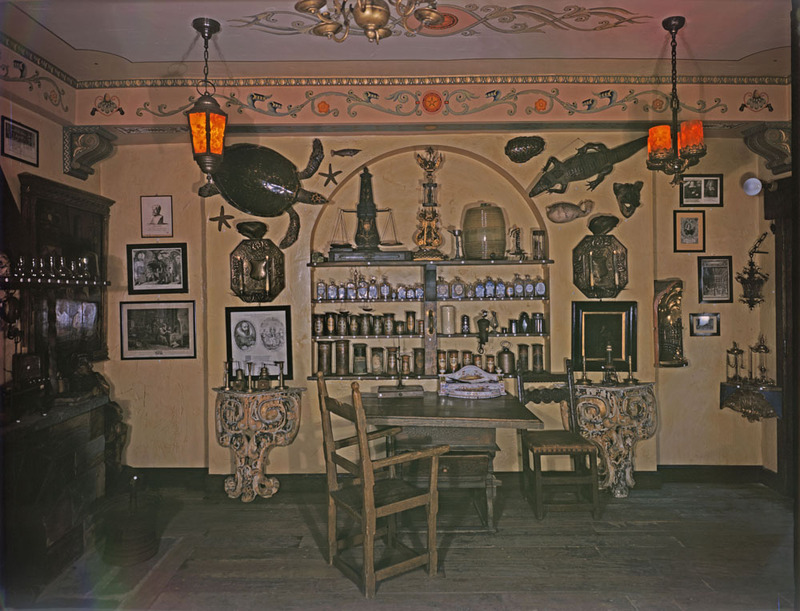 Two wooden display tables that had originally stood in the center of the reception room at the Squibb Building in New York City and the Arts and Industries Building displaying the book collection along with franchises; small artifacts not directly related to the history of pharmacy were removed to create an atmosphere of a true apothecary. One of the more innovative touches at the Arts and Industries Building was a taped recording; a “sound description,” as Griffenhagen described the continual loop incorporated into the exhibition. In his planning schedule of January 1958 he requested the recording be retained and arranged in such a way that visitors would break an electric eye as they entered the apothecary, triggering the sound track. Further changes included the transfer of the book collection in 1979 to the Dibner Library of the History of Science and Technology one of the Smithsonian’s collections of rare books and manuscripts housed at the NMAH. Perhaps the most significant change but certainly the most contentious change was the naming of the collection. 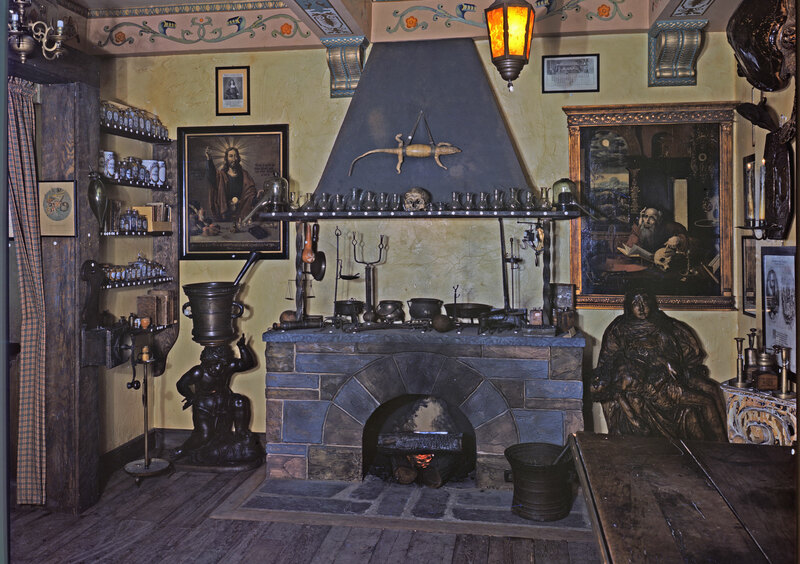 Over the years the collection acquired numerous monikers: the Jo Mayer Collection, the Ancient Pharmacy, the Muenster Apotheke, the Medieval Pharmacy, the Old World Apothecary Shop (as it was referred to in the 1956 Smithsonian Guide Book), and finally the European Apothecary since 1966. Every custodian of the collection has created his or her own interpretation. In the 1930s overt advertising of pharmaceutical products was looked down upon. An alternative route was to advertise through exhibition. For a large pharmaceutical manufacturer such as the E.R. Squibb Company to own and exhibit such a unique collection created an image of respect for history. The company could be viewed as a trusted friend, in an advertising ploy similar to those of medieval and renaissance pharmacists who hung lizards and fish from ceilings to advertise their fresh, high-quality products. And although the E. R. Squibb Company was established in 1858, the Ancient Pharmacy created an image of timeless traditions that the company would associate with their contemporary products. The exhibition presented a romanticized view of an old apothecary shop, emulating the spirit of past centuries. 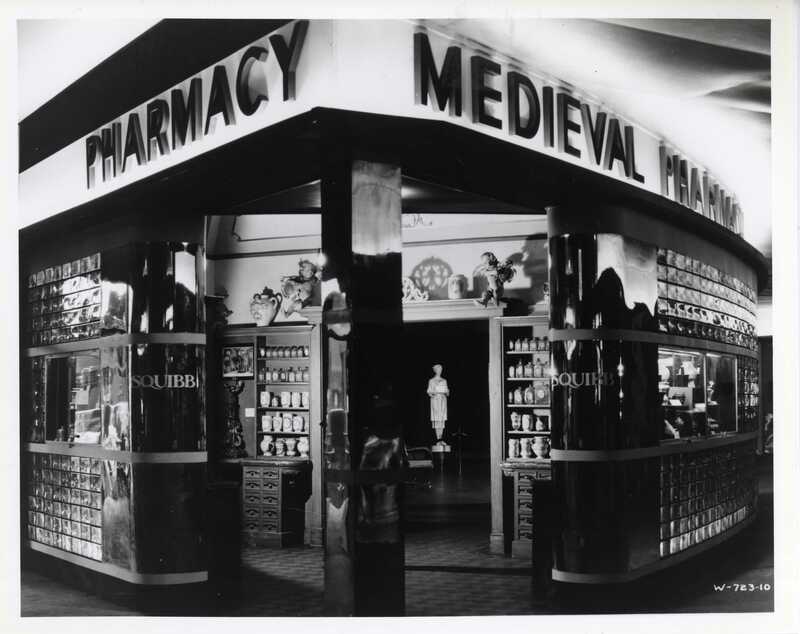 Squibb advertised the collection as a “genuine apothecary shop intact in every detail and representative of an era when pharmacy served the needs only the medical community”. On September 1, 1991, at a reception given by the World Congress of Pharmacy at the National Museum of American History, executives of the Bristol-Myers Squibb Company and the American Pharmaceutical Association jointly singed a Deed of Gift donating the European Apothecary collection to the Smithsonian.